“¡Comadre, tanto tiempo!. . . Comadre, it’s been a long time!” It’s the monthly Saturday morning cleanup at the community garden, and it’s a happy and unexpected reunion when Susana and Elvia spot Bertila. The three of them had squeezed tomatoes, chiles, corn, radishes, and herbs into a tiny garden plot, sometimes working together, sometimes taking turns cultivating and watering this ten-by-ten-foot patch of earth. But Bertila stopped coming to the garden for two months over the summer because of personal problems, which include a husband in immigration detention and juggling new housecleaning jobs while looking after her own rambunctious sons, ages eight and ten. 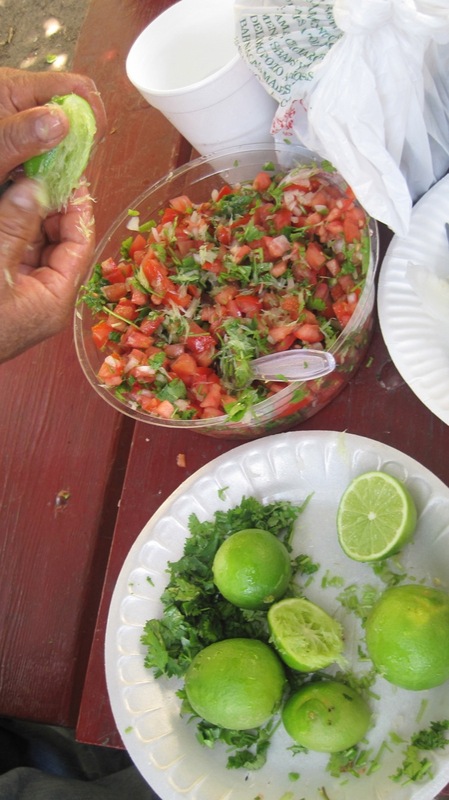 While she was gone, Susana and Elvia watered her papalo—even though they both dislike this pungent herb, a favorite of people from Puebla and Oaxaca—and now like good friends everywhere, they pick up where they left off, joking and laughing as they pull out the remains of summer’s bountiful corn stalks and tomato plants. On this Saturday morning, about twenty adults, all of them from Southern Mexico and Central America, participate in the cleanup while children run around, with the little ones digging up worms and roly polies and older kids helping out with the composting. After the cleanup, all the gardeners run to their apartments—located in the few surrounding blocks—to gather ingredients for a late lunch in the garden. There is no kitchen counter, no sink, and no built-in barbeque here, but that doesn’t stop them—these women are accustomed to improvising and making do with what they have. They rinse tomatoes in plastic bags, expertly mince onions, chiles, and garlic with dull knives, and pick squash and herbs. 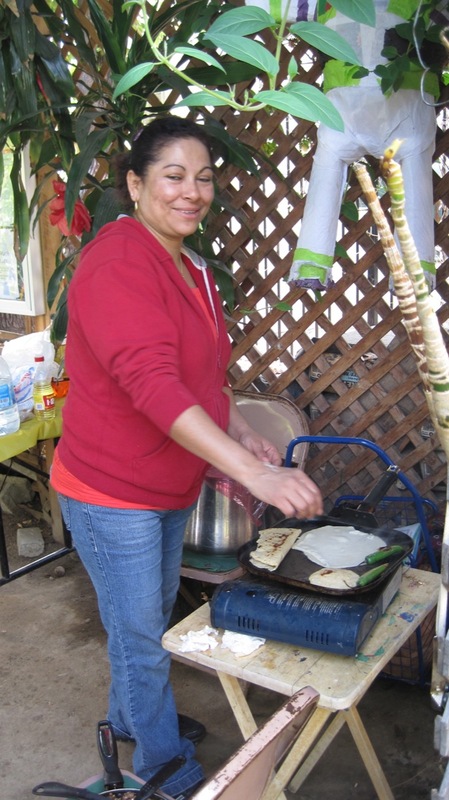 They knead masa over a rickety folding table, and from the toolshed they drag out a propane stove and paper plates. Helicopters fly overhead and sirens wail, but here in the garden, on rustic benches below a shade structure, the morning turns into a long, delectable afternoon of squash and mushroom-stuffed quesadillas. Laughter stretches out until dusk. In inner-city Los Angeles, just west of the downtown high-rise buildings and trendy upscale restaurants is a poor, densely populated neighborhood where most households get by on less than $20,000 a year. Here at the garden, the mujeres weed, water, and cook to feed their families, but they are also tending to themselves, forging new relationships and support networks, and re-creating scenes from homes left thousands of miles behind. Men and children come here too, but this is really a women’s place. After all, men can congregate on street corners, by the driveway of an apartment building, or at one of the larger public parks in the Westlake area; many of these women told me they feel they cannot comfortably do so. They are all navigating life in a new nation and city, trying to chart the best possible paths for themselves and their children. The garden is a place of growth for plants and people. But an unexpected conflict over the administration of the community garden prompted several of these community gardeners to lose their parcelas, and others departed too. This is a story about these women and the challenges of supporting nature and community in the inner city. I am an ethnographer. 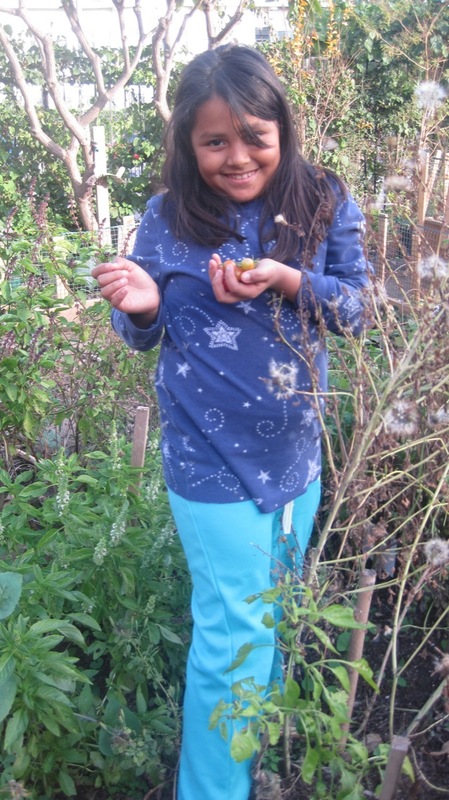 I spent over one year conducting participant-observation research and in-depth interviews at two small community gardens located in the Pico Union and Westlake neighborhoods of Los Angeles. I was assisted by Jose Miguel Ruiz, a young man who grew up here, and who had just returned to the neighborhood after graduating from University of California, Santa Cruz. We attended community meetings and women’s empowerment classes. We raked, weeded, pruned, and swept at the collective clean-up events, joined impromptu birthday celebrations, contributed food, and enjoyed shared meals. I also spent many hours sitting on benches, chatting with whoever happened to be there. Everyone knew we were there as researchers, and I obtained consent from the gardeners and institutional review board authorization from the University of Southern California, where I teach. Under what are known as “human subject” rules in academia, I promised to protect people’s privacy through preserving their anonymity, so in this essay I use pseudonyms for the people, the garden, and the nonprofit that eventually took it over, even though many people in Los Angeles will recognize parts of this history. Like the women in the garden, I am Latina and I speak Spanish. But my comfortable, professional class life as a professor insulates me from the daily hardships insiders in this community face. Through ethnography, I strive to study practices—what people do—and to understand how they see the world, the meanings that develop as they interact with one another. Urban community gardens have always faced uncertain property rights and often only a tenuous right to exist, but these threats typically came from property owners, developers, and city authorities. 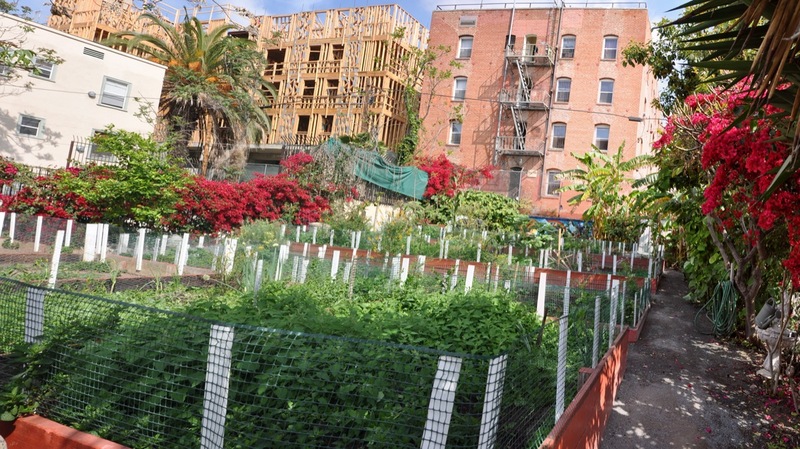 As recently as 2006, one such dispute ended in the bulldozing of what is believed to have been the largest urban community garden to ever take root in the nation, the South Central Farm. Until its demise, over 300 families, the majority from Mexico and Central America, and many of them from indigenous Mayan, Mixtec, Zapotec, and Triqui backgrounds, grew food on a 14 acre tract in an industrial warehouse district of what we now call South Los Angeles, near Watts and Compton. These urban gardeners tended substantial parcels, each averaging 1,500 square feet, big enough for families to build small shelters or casitas where they gathered for socializing and eating. Some people grew enough produce to sell to taco trucks and restaurants or to families seeking their beloved papalo. The Academy-award-winning documentary The Garden chronicled the conflict that resulted in the demolition of the South Central Farm. It was essentially a struggle between the legitimacy of private property held by a multimillionaire (who continued to leave this large property vacant) and the illegitimacy of poor people’s collective claims to the right to productively grow food on that land. Gardeners and activists organized an energetic campaign to save South Central Farm, drawing the support of celebrities and getting Annenberg Foundation funds to make a bid to buy the property, but they lost the battle and it was bulldozed. There is now a renaissance of urban community gardens and urban agriculture sprouting in cities across the nation, fueled in part by hard times brought by the global financial crisis and by the ongoing dearth of fresh fruits and vegetables in poor, inner-city neighborhoods. Community gardens may also serve as incubators of social capital and as catalysts for organizing campaigns to promote low-cost housing, stop neighborhood violence, promote awareness about breast cancer, or any of a number of public projects. Today many community gardens are protected from demolition by nonprofit organizations, land trusts, parks departments, and municipal lease agreements. Countless individuals and organizations have worked tirelessly to establish the mechanisms and institutions for expanding and protecting community gardens. While community gardens often start informally with a group of enthusiastic neighbors and activists deciding to grow food on a vacant lot, the logistics of running a collective urban garden are complex. A web of local nonprofits, regional coalitions, land trusts, and a national consortium, the American Community Garden Association, offer institutional support to community gardens, providing guidelines, technical assistance on handling water bills, testing soil quality, securing liability insurance, governance, annual fees, and the like. With this formal support, however, new tensions and trade-offs have emerged. The Franklin Community Garden—a pseudonym—is a pocket-sized oasis of trees, flowers, and Mesoamerican vegetables and herbs growing in an otherwise very cemented part of inner-city Los Angeles. It’s open to the public from dawn to dusk, 365 days a year, and the front section serves as an informal gathering spot and the site of many community meetings. On late afternoons, comadres (co-godmothers and female friends) gather to chat on benches or under the shade of the casita, a dirt-floor patio that serves as the communal hub. Time takes on an elastic quality in late afternoons and especially on Saturdays, with storytelling, gossip, and laughter. When I first visited during the summer of 2010, I found clucking chickens and a spectacularly plumed rooster roaming freely. Around the perimeter of the garden, bananas, sugarcane, avocado, hoja santa, a mango tree, and three small papaya trees gave the garden a tropical feel. The back half of this standard-sized city lot had raised vegetable beds, rented out to parcel holders at the rate of $30 a year. Only people renting the parcelas and their family members were technically allowed to enter this area behind a locked chain link fence. Women gathered at the garden in the late afternoons to relieve the stress and strain of their lives. At home, in their small crowded apartments, some said they felt as though the walls and their problems were closing in on them. Some were caring for sick family members, or had husbands and sons in detention, facing deportation or prison—between 1997 and 2012, the US government carried out 4.2 million deportations and removals, and nearly all of these deportees were Latino men from Mexico, Guatemala, Honduras, and El Salvador, creating a crisis of widespread social suffering in Latino families and communities.¹ These women were on the front lines of holding things together, patch-working medical services and education for their families. At home, all of them worried about bills. Inside the Franklin garden, Monica, a charismatic mother of three, was the nucleus of community life. She was the official gatekeeper, paid a nominal fee to open and close the front garden gates daily at dawn and dusk, and to organize the collective cleanups. She welcomed newcomers, connected people, and provided advice on everything from herbal remedies, to the necessity of carefully reading the fine print on rental contracts, what vegetables to plant when, and what month to harvest the sugar cane or prune the avocado tree. But managing a community garden is complex, and a nonprofit organization—which I will refer to as Green Spaces—had purchased the property in 2007, offering three reforms: 1) land security (there was no risk this garden would be bulldozed); 2) resources for programming, materials, and for paying Monica to serve as gatekeeper and overseer; and 3) new rules and tighter administration of the garden. Green Spaces rejuvenated the garden by building up the plots, provided for shared garden tools, and gifted sacks of soil amendment and mulch. They also funded a smorgasbord of free community workshops, classes, and holiday celebrations. By far the most popular class was the women’s empowerment class, taught by a Latina life coach on Saturday mornings under the casita shade structure. Community gardeners, neighborhood residents who did not garden, and even a handful of men participated in these classes, from which I too graduated, twice. To prevent the children from interrupting their mothers during class, Green Spaces paid another woman to lead arts and crafts classes for kids in another area of the garden. Green Spaces collected information on how many people participated in workshops such as these and holiday parties featuring free food. They required all plot holders to attend monthly community meetings. Like other nonprofits, Green Spaces must supply information to their granting institutions, showing how many people they have served. 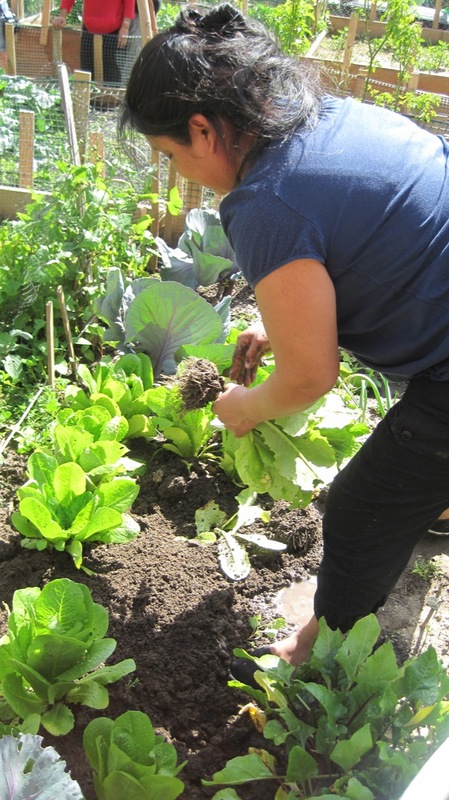 The community garden meetings, where I was often asked to take minutes and read the rules in English and Spanish, were led by a Green Spaces staff member, a Mexican immigrant with years of community organizing experience whom I shall refer to as Teresa. She always started the meetings with an ice-breaker, encouraging everyone to say something. She then facilitated the meeting, typically focusing on governance issues—Was everyone following the rules? Participating in the cleanups? Who left the gate unlocked that one night?— as well as planning upcoming events and holiday gatherings and assigning volunteer work teams. I sat through over a year of these monthly meetings and witnessed the tensions that emerged. First, there were problems around the selection of new parcel holders. This is a familiar issue at urban community gardens, where demand often outstrips the supply of parcels open for cultivation. At Franklin, the vegetable beds were small, but many of the mujeres found that competing demands with family and work precluded them from regularly watering and weeding, and that the $30 annual fee was too expensive. So in some cases, two or three women would agree to share a parcel. That way, when Bertila, for example, had a crisis in the family, her friends could take over tending the plot. This seemed reasonable enough to the community gardeners, but it was against one of Green Spaces’ many rules, and Green Spaces’ organizer, Teresa, had begun cracking down on this practice. Community garden members tried in vain to fudge the issue, but it became “illegal” to cultivate a plot if your name was not on the official contract. Some garden members, including Bertila, Elvia, and Susana, ultimately lost their parcelas. Another familiar problem at all community gardens is the pilfering of peppers or tomatoes. One day, after an unsupervised child had picked someone’s ripening tomatoes, I watched the gardeners talk out the conflict amongst themselves, not in a formal meeting but in the aisles between the parcelas, during one of the collective cleanups. But in response to a complaint, Green Spaces imposed a new rule: no more than three people per family could now gather back by the parecelas. One Sunday morning I found rule-abiding Hortensia, there with her husband and three children, ready to prepare the soil on their newly acquired plot. This was an exciting day for them. Almost as if memorializing the moment she explained, “Es la primera vez que mis hijos van a tener contacto con la tierra. . . It’s the first time that my kids will have contact with the soil. Back there, we all grow up working the land, but this is something new for my kids.” Here, finally, she would be connecting her children not only to la tierra, but to an ancestral tradition of the past, and her younger self at home in Mexico. But in order to follow the rules, she and one child had to remain outside of the chain-link fence, while the husband and two of the children turned the soil. As I watched, it looked as if this family was divided by a border fence or something like a prison visitation window. For Green Spaces, the garden was a public space that had to be open to all, even those who do not live in the immediate neighborhood or who may have never previously set foot in the garden. 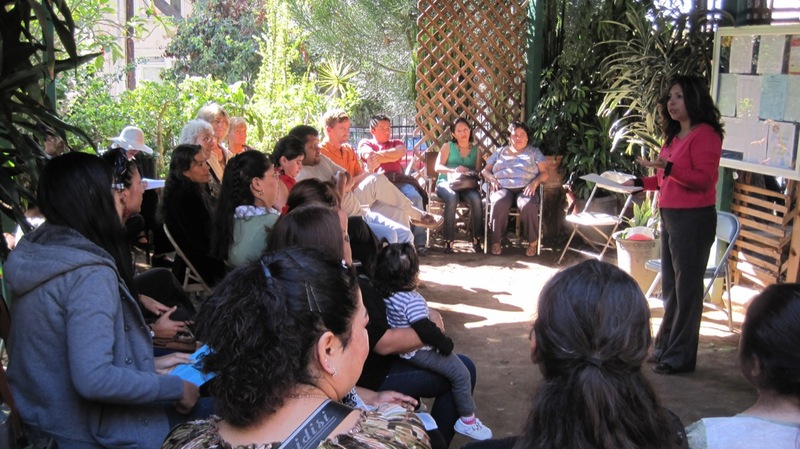 As a nonprofit organization initially funded by the City of Los Angeles and now supported by foundation grants, Green Spaces had to ensure that garden membership was not personal or particular, but rather followed formal, generalized procedures, which included abiding by the rules of conduct, and signing a formal contract. The contract, not the community, defined membership rights. These sorts of tensions over membership and decision-making intensified when Green Spaces obtained substantial public funds for infrastructural improvements. In anticipation of spending a jaw-dropping $350,000 acquired from public and private sources, the Green Spaces community organizer asked garden members how they wanted this spent. The gardeners had been instrumental in helping to get the garden improvement funds, as they were trotted out to testify in front of the granting agency. Over and over again, in endless community meetings, the gardeners said they wanted just three things: a toilet, chickens, and a brick barbecue, preferably with a faucet too for rinsing vegetables and a counter surface for preparing meals. Those simple features were what the gardeners needed to make the garden a truly homey place in the image of their own homelands. After spending many six or seven hour stretches in the garden where I was often slightly dehydrated because I tried not to drink water, I too enthusiastically testified to the need for a toilet. Green Spaces staff told us that a toilet was too expensive and dangerous—it might attract prostitution and drug selling—and it would require maintenance staff. They said chickens were incompatible with gardening and possibly illegal in the city. While no good excuse was offered for not building cooking facilities, even a brick barbeque, these were also denied. During 2010 and 2011, we met monthly to discuss these matters, moving to a church basement during the winter. Sometimes Green Spaces sent young, well-meaning landscape architects to the meetings, and they presented different ideas and options for new garden amenities. They projected photos taken from suburban public gardens, where families gathered to watch big screen movies in an outdoor space or played chess with giant-sized pawns and queens. These looked like images out of Sunset magazine, and the ideas fell flat with the community gardeners. In the end, here’s how the democratic design process went: We were handed Post-it notes and asked to walk to the front of the room and cast our votes by choosing between terra-cotta and brown brick pavers, picnic tables with yellow trim or blue trim. The chickens, a toilet, and a built-in barbecue never appeared on the ballot. Eight months later, the garden reopened. The street was blocked off to traffic, and folding chairs, tables, a podium, and microphone were set up on the street directly in front of the locked garden gate. Youth from the LA Conservation Corps were cleaning and setting up, together with a few remaining volunteers from the community garden, including myself. I was given the task of hanging crepe paper for the ribbon-cutting ceremony. Many dignitaries spoke, including the executive director of Green Spaces. “The community came to Green Spaces,” she said, “and all of these new garden designs came out of the community voice.” That word, “community,” was repeated many times by those who spoke at the microphone. After the ribbon cutting, we marched into the reconstituted garden to have a look. It now had a cleaned-up, slightly institutional look. The enormous chayote plant that provided a cubbyhole of shade was gone, and so were a lot of the trees and the jumble of flowering bushes. The new garden featured new pavers, electricity, lights that Jose Miguel described as “prison lights,” cinder-block walls where the rustic casita had once stood, terracing to allow for better drainage, a new shed, and miniature picnic tables bolted to the ground. Looking around the sea of people that day, I recognized only a handful of the stalwart community gardeners who had brought so much life to Franklin Community Garden. Monica, Armando, and about half of the women, all key outspoken core community members—not to mention the chickens, a toilet, and the barbeque—were nowhere to be seen. At the grassroots level, the community garden is elemental and material, a place to transform soil, plants, seeds, and water into food and foliage, and a place where friendships, alliances, gossip, and support form among people with no access to land or to the financial and legal power valued in our society. We need nonprofit organizations, land trusts, and government agencies to combat the privatization of all social life and property so that more community gardens, public parks, and urban agriculture can flourish in the city. But protecting these spaces is about more than protecting the land. Each garden serves its particular community, and each community has its own particular set of needs and challenges. Bringing more people in is a worthy goal, but a garden must serve its own community or it’s not a community garden at all. Any approach that excludes the very gardeners who cultivated the community to begin with is a failure as sure as losing the garden to private developers would be. Social inequality and power on the land have always been part of the story of Southern California, with successive waves of conquest, colonization, property disputes, land development, and labor exploitation etching the garden-like landscape of California. The immigrant community gardeners who gather in inner-city Los Angeles, like their peers in Seattle, Boston, or New York City, are actively reshaping the landscape too now, producing food and reinventing possibilities for themselves and their families and communities. But their quest for community autonomy and transcendence is constrained by powers beyond themselves—well-intentioned and not so well-intentioned. The spatial theorist Henri Lefebrve used the term “representational space” to refer to places that have been collectively and organically created by daily use.² The community gardeners created their own idealized representation of nature and community in their inner-city garden paradise, and when Green Spaces funds became available, they were open to accepting change. Throughout the design process, the community gardeners remained loud and clear on what would constitute improvements—chickens, a bathroom, and cooking facilities—but instead, they got a different “representation of space,” one imposed from above by Green Spaces and the landscape architectural firm. They no longer felt truly represented. Some landscape architects and scholars recognize the importance of informal practices such as those of the Franklin gardeners and advocate for “a collaborative model of placemaking in which citizen groups and city agencies have equally important roles.” But as we saw in the Franklin Community Garden, differences in power make collaboration difficult at best and at worst impossible.³ The design process was only superficially collaborative, and the creativity of the women’s informal community was overruled by formal procedures and expertise. Gardens are inherently messy. Struggles over the rules of the game—who can cultivate parcelas and under what terms, what infrastructural improvements are desirable, and which ones can be implemented—reveal fundamental power inequities and trade-offs. Organizational benefactors such as Green Spaces ensure that community gardens like Franklin will never be razed as the South Central Farm and so many others have been—and that is a laudable achievement. We need more formalized agreements and institutions to support public community gardens and urban farms. Formal organizational support and protections, however, come with strings attached, creating new tensions and trade-offs. The experience of the Franklin gardeners suggests that there is still a lot of spadework to be done before this new era of professional organizations cultivating urban gardens can fully respect and support community among these transplanted paradises in the inner city. First and last photographs by Robbert Flick, all others by the author. 1 Tanya Golash-Boza and Pierrette Hondagneu-Sotelo, “Latino Immigrant Men and the Deportation Crisis: A Gendered Racial Removal Program,” Latino Studies 11(3): 271–292. 2 Henri Lefebvre, The Production of Space (Oxford: Wiley-Blackwell). 3 Jeffrey Hou, “Making and Supporting Community Gardens as Informal Urban Landscapes,” The Informal American City, Vinit Mukhija and Anastasia Loukaitou-Sideris, eds. (Cambridge: MIT Press, 2006), 79 –96. Randolph T. Hester, Design for Ecological Democracy (Cambridge: MIT Press, 2006).